﻿ How to Make Homemade Marshmallows! 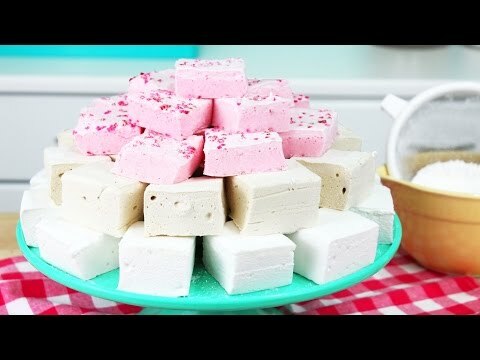 How to Make Homemade Marshmallows! 1. Grease a 9” x 9” square pan with butter. Set aside. 2. In the bowl of a stand mixer, pour in ½ cup water and sprinkle gelatin on top. 3. In a medium saucepot, bring ½ cup water, granulated sugar, corn syrup, and salt to a rolling boil (rapid and large bubbles) and boil for 1 min or until a candy thermometer reads 240 F. Do not stir while the mixture is cooking, and be careful! This mixture is extremely hot – ask an adult for help if you’re not comfortable handling the boiling sugar syrup. 4. Mix gelatin mixture a few times to break up the clump, and slowly drizzle in sugar syrup along the side of a bowl. Turn to high speed and whip for 8-10 min until thick and fluffy. 5. Immediately pour into prepared pan, and spread out with an offset spatula. Use a greased sheet of plastic wrap to smooth out the marshmallow, and leave to sit for 6 hours or preferably overnight. 6. Sprinkle a work surface with powdered sugar and cornstarch mixture, and turn out marshmallow slab. Cut with a greased knife, and sprinkle with additional powdered sugar/cornstarch if needed. Replace 1 cup of water with 1 cup of strongly brewed coffee. If desired, add 1 tsp of espresso powder to whipped marshmallow mixture. Tip: To clean saucepot, just fill with warm water and let soak for 1 hour. The sugar will dissolve quickly, and the pan will be completely clean! Nothing says fall like Sweet Potato Pancakes topped with Chopped Pecans and Homemade Marshmallows!